The Owl and The Coconut Turns Five! 2019 marks our 5 year anniversary at The Owl and The Coconut and we couldn’t be happier! We have been sharing Mindful Art in Manchester for over five years! To celebrate this milestone we have a brand new shiny logo and here’s a sneak peek! Although we are sad to say goodbye to our old cute owl and wonky coconut logo, fear not they are still at the heart of all we do and will still be popping up at our events. We feel our new logo reflects our growth, we are maturing, we are growing up and we are celebrating our achievements with a splash of gold! When we first started out, not many people had heard of mindful art but now it seems to be everywhere! We believe that what sets us apart from the rest is our social impact, how we help and invest in people to help reduce stress and increase levels of health and happiness for social good. Our most successful way of doing this is our Mindful Art Practice 8 week Course MAPS. Where we take people on a creative healing journey. Each week we stop to explore the work of a different artist. 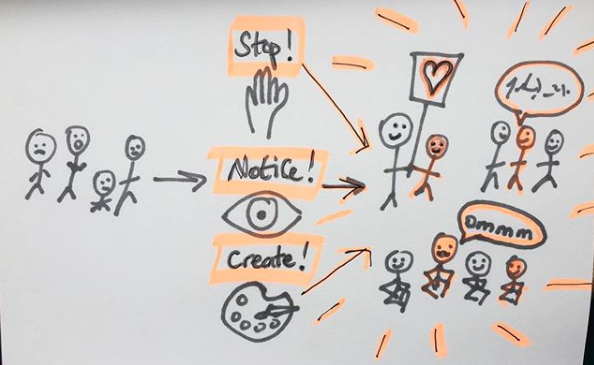 We use meditation to notice our thoughts, feelings and automatic reactions and we use mindful art to create new neurological pathways to move from auto pilot reactions to creative mindful responses. Regaining power and steering our lives the way we choose, building our networks, confidence and connections to common humanity along the way. The organisation is lead by Gemma and Pam who are qualified therapists supported by our amazing team of dedicated and passionate freelancers and volunteers who all have first hand experience of the benefits of mindful art. Working together to share mindfulness and creativity to increase health and happiness for all! Over the last five years we have shared mindful art with thousands of people! Taking to the streets to meet people where they are including festivals, markets and even bus-stops! Last year saw us move into our first home: The Nest in Levenshulme Old Library where we have been able to put down roots, grow plants and build a network for health and wellness with like minded souls. We have partnered with charities and big organisations including DePaul UK, Mind and Manchester Art Gallery. 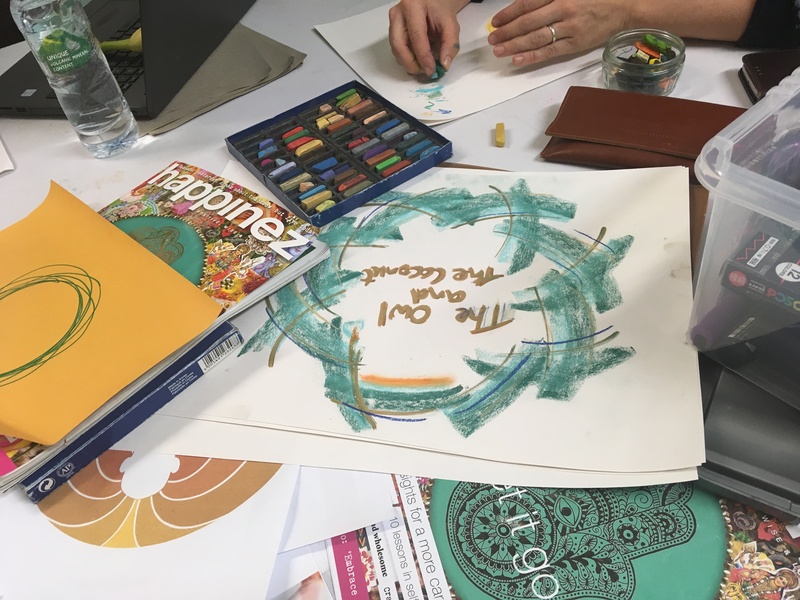 We have shared mindful art at Manchester’s first ever Mindful Living Show and the Science and Industry Museum as part of their Cultural Late special exploring the connection between Health and Art. What amazing experiences they were! We have received support and funding from the Big Lottery, The Paul Hamlyn Foundation, Greater Manchester Mental Health Service NHS, Manchester City Council, Santander and the School Of Social Entrepreneurs. We have also had invaluable help from Lucie at Salford University, who has lead us on creating our new logo and refining our use of social media to support and share our work. Along the way we’ve stopped to ask people about their levels of wellbeing using an evidenced based measure called WEMWEBS. and we have been blown away to see the increase in health and happiness reported back to us. It’s said that an increase of 3 points marks a significant increase in wellbeing. The average that we have had reported by people who attended our 8 week courses is 6 and we couldn’t be prouder! Louise says: “The Mindful Art Practice course changed my life. It took me from being stuck in living in my head to the happiness of living in my heart.” Read Louise’s full story in her blog post here. We were stopped in our tracks when Local GP Dr Arora from Ashcroft Surgery knocked on our door and said “What is The Owl and The Coconut and how have you been helping so many of my patients?!”. Since that day we have been working with Dr Arora to help more and more people join our Mindfulness course to regain power over their health and happiness! Taking time to evaluate the impact of our work on peoples wellbeing. As we reflect on the last five years and plan for the next, we have big ambitions! We want to begin to train people to deliver our Mindful Art Practice Course so that we can share this with more and more people! To do this we are working closely with Dr Arora to bring together the evidence of our work and linking up with YMCA Central in London who have amazing ambitions in their Eudaimonia supported by Charles Leadbeater; a leading authority on innovation and creativity. We are continuing to work to break down mental heath stigma and make tools for health and happiness available in every day settings for positive social impact and world change. If we were all a bit more mindful, creative and happy, wouldn’t the world be a better place? We certainly think so! If you’d like to join us to try Mindful Art we have taster sessions coming up click here to book and come and have a try for yourself. You don’t have to be good at art or to have ever meditated before! All you need to bring is your self! My journey from being in my head to my heart …..
Mandala Mindful Art by Louise. Original illustration made for The Owl and The Coconut by Lauren Kelly. Growing up I was a shy and introverted child, who was very self-conscious. Entering my twenties, I was diagnosed with depression and had developed anorexia. Luckily for me I had a supportive GP who helped me to start to eat, but battling my thoughts was so much harder. Throughout my adult life I was absorbed with believing myself to not be enough. I had various episodes of crippling anxiety and depression. I tried everything to fix me-under eat, over exercise, moved jobs and home, too much alcohol, no alcohol and so on… nothing helped. As a nurse, the only time I felt worthwhile was with my patients – I was being further depleted emotionally and physically. At home, an episode of domestic abuse confirmed for me my feelings of worthlessness. At the end of 2018, I was lucky enough to go on a 5 day silent retreat. I say lucky, but to be honest, I didn’t really want to go. I didn’t have the funds to go. Or the time. And I didn’t want to leave my young family or my work family for that long. But I had to go really, as part of my Mindfulness teacher training. So booked it and shut up, literally. In booking it, I was met with my working class edges of thoughts, “sitting in silence in a country manner in Devon – *eye roll* – how’s that gonna help anyone or anything?” So I chose the specific retreat and teachers very carefully. In my research I found Zohar and Nathan, the founders of SangaSeva: “sangha-” a group of people who feel connected to a similar cause, a community of spiritual friends, a body of heartful activists. “-seva” means offering the best we have to give. Often it is translated as selfless service: An action which benefits another as much as it benefits us, as long as we wish to cease being self-centred, that is. Goodbye internet, we’re taking a break! This Christmas all of us at the The Owl and The Coconut will be turning off push notifications and turning on our out of office reply. Because it’s time to stop. Not forever! Just for the Christmas break! When you are really passionate about what you do it’s tempting to never stop. But is that healthy? In October we worked our socks off on social media to get votes for an Aviva Funding Pot. The vote opened while I was on holiday with my family; I felt I just had to be on social media pushing the cause. This wasn’t great as it meant every time my phone connected to the internet I was overwhelmed with updates and calls for my attention, taking me away from the beautiful beach I was on. My mind wasn’t on holiday at all. We received some very challenging messages and my mind began racing with replies, who to turn to for support, and how to look after the team thousands of miles away back home. I couldn’t believe how the worry thoughts grew like vines in my mind and pushed out my present moment connections and experiences. Auto pilot kicked in, like that pretty bad Adam Sandler film ‘Click’, and I began to fast forward through my family time to get back to sorting out work stuff. But how could my mind be hijacked in this way?! All this mindfulness work! I’m the boss of my mind, right? I have a toolbox full of skills for coping with stress! So I made extra time for my mindfulness practice because it was a time I needed it most. As we reach the end of 2018 I’m feeling grateful and reflective as I arrive home after an intensive few days on the Paul Hamlyn Foundations Ideas and Pioneers retreat. Um retreat, well that fooled me! It was less pamper and more Big Brother meets the Apprentice with added layers of social value and ethical trading for pioneering social change. Amazing and exhausting! I met loads of absolutely amazing people doing amazing things to change the world for the better! It’s now 5am on my first night home, I’m back to the happiness of being with my husband, son and dog but I can’t sleep. My mind is buzzing with all the thoughts and actions inspired by the whole event and the amazing social entrepreneurs I have meet. Reflecting back to January 2018, just eleven months ago Pam (Co-Director of The Owl and The Coconut) and I sat in Trove cafe, in Levenshulme, with no funding and no base to work from. Two therapists with a dream that mental health services must evolve and break out of the confines of ‘clinical settings’ to get to everyday people before crisis point. With higher and higher levels of people experiencing disabling symptoms stress, anxiety, depression and chronic pain, that change is needed now. Growing up I’ve often struggled with low moods and a general feeling of low self-worth. I internalised all of my negative emotions and as such never received specific treatment. At 22, my mental health reached its lowest stage and I was diagnosed with depression. Since then I have developed a much better understanding of mental health and its importance. Cognitive Behavioural Therapy sessions helped me to question my negative thoughts for the first time. I came away from the sessions with a kinder, more empathetic approach to daily life and myself than ever before. The CBT sessions led me to some reading around mindfulness and its benefits. Despite being extremely sceptical initially to an activity I saw as only for ‘spiritual people’, I was persuaded by my councillor to enrol on to an 8 week mindfulness course. My preconceptions were only validated during the first session when we were asked to stare at a raisin for 5 minutes. My initial thoughts were what on earth could be achieved from staring at a piece of fruit. As people started to talk about the raisin’s creases and how it felt on their tongue, I was close to making a sharp dash to the exit; away from these ‘spiritual folk’. I did though persist with the course and soon began to understand and reap the benefits of an increased awareness. I now regularly practice mindful meditation which helps me to stay firmly anchored in the present and enjoy all aspects of life (including raisins). I am kinder to myself and those around me and am accepting of emotions that I previously tried to block out; sadness, anxiousness, vulnerability etc. I believe what I have learnt about mindfulness will help me in every aspect of life for as long as I am around. For that reason, I would encourage anyone who hasn’t done so already to give mindfulness a go! Thank you so much Levenshulme for welcoming The Bee With No Name! Here at The Owl and The Coconut we had a super time meeting so many fab local community members from all walks of life, young and old, in our five community consultation sessions and all the online ideas sharing! What do you love about Levenshulme? I dash (virtually) to my inbox and can’t believe my sleepy eyes as I read the news we’d been hoping for. I can’t believe it! I’m super happy! I’m crying! It’s real! It’s happening! People believe in us! We now have money to share our Mindfulness and Mindful Art Practice courses and drop in sessions. It says “Please do share this good news with your local community and MP”. Cue more tears. We want to say a heartfelt thank you to the Big Lottery Fund for helping us to deliver our work to the community. Gratitude in abundance from The Owl and The Coconut team. Thanks to the funding from the Big Lottery we are delighted to be able to offer free places on the Mindfulness MBSR 8 Week group, the Mindful Art Practice MAPs 8 Week group. As well as the weekly Mindful Art drop in sessions that will run for a whole year. Click here to see full timetable for drop in workshops. Cut to that very same night and we are being welcomed into our new Nest at the beautiful Levenshulme Old Library. The centre is full of amazing local Levenshulme people, celebrating the achievement of not only saving the building, but now turning it into an arts centre for all. We all laugh as the Levenshulme Players act out a not so unfamiliar story, depicting the strength of our community in Levenshulme and the journey of the new arts centre so far. We were live on the radio with our building buddies – the amazing All FM and filmed by the lovely Martin and Benedette for Sky TV channel ‘The Irish at home and abroad‘. Then we stood next to no other than Mr Afzal Khan, our lovely local MP for Gorton South and told him the great news of our successful funding bid and the benefits it will bring to the area he represents. We also spoke to our supportive Levenshulme councillors Dzidra Noor, Basat Sheikh and Bernard Stone and the Longsight councillor Luthfur Rahman – the executive member for schools, culture and leisure. It was a great day and night and one we will no doubt remember as the catalyst for our future as a mindful arts space in the community. There’s a giant bee coming to Levenshulme and you can add to the design of it! Exciting talks began at the launch night of the beautiful Levenshulme Old Library, where we are setting up our Nest, alongside the brilliant All FM and the amazing plans by LOL, ‘Sharing art and culture at the heart of our community’. Celebrations were well underway that night! With the library now being transformed into a community arts centre, amazingly saved by the local community, there was a true sense of pride in the air ,which was brilliantly acted out with great humour and fun by the Levenshulme Players. After some of the guests spotted the top secret dragon hiding in the corner, painted by the amazing local Levenshulme artist Jodie Sliverman, conversations began to flow about Bee in the City. Bee In The City features the stunning public art trail of over 80 individually designed giant bee sculptures, crafted by regional artists, due to weave their way across the city of Manchester during summer 2018. Both the local councillors and the Levenshulme Traders Association were keen to secure a Bee for Levenshulme, to take pride of place on the high street, and we are delighted to have been asked to run a series of community art workshops to get the design for the Levenshulme Bee from you, the people. The Bee arrives as a blank canvas, and what goes on to the Levenshulme Bee is for you to decide! What do you love about Levenshulme? What makes you proud to live in Levenshulme? For me, it’s the friendliness of the people. Knowing I can walk into any local pub,café or shop, to be greeted by a smile and chat happily for ages! It’s walks on Highfield County Park with my dog surrounded by silver birch and pine trees. It’s the school runs to Alma Park and swimming lessons at Arcadia. Summer festivals at the Klondyke, brews in Trove, cocktails in the Dice Lounge, beers in Fred’s Ale House and yummy food from the many fab traders at Levenshulme Market. I really do think Levenshulme is an amazing place to live. What makes you proud to live in Levenshulme? What do you love about our Lev? Come and tell us all about it, have a draw and a play. No pressure to be an amazing artist, we have Jodie for that! Jodie will pull together the themes from the thoughts and designs that you share, to paint onto the bee. So come along to one or all of the Levenshulme Bee workshops, show us your love of Levenshulme, and let’s work together to make the Levenshulme Bee something to bee really proud of! Let’s make our bee great and help raise loads of money for The Lord Mayor of Manchester’s charity – We Love MCR Charity, to improve the lives and opportunities of Manchester people. Just think of all the sightseers that will swing by for a peek! All stopping off for a brew and a shop on the high street no doubt! Let’s help Levenshulme Bee amazing! How my Mindfulness orientation changed my relationship…with my bed! I recently started the on the Mindfulness Based Stress Reduction (MBSR) course offered by Mind in Salford. The course starts with an orientation and then 8 subsequent Mindfulness based sessions. While I was keen to take part in the course to further my training, I hadn’t given much thought to the possible benefits it might bring to my emotional well-being, an oversight which was soon rectified during orientation. As the course leader discussed the content I was very quickly reminded of my issues with insomnia, and I was excited to see if the course would help. By the end of the first meditation, a brief body scan, I had already realised how tired I actually was, and I could barely keep my eyes open (it was not due to being bored I must add). By the second meditation, it had come into my awareness that I have a love/hate relationship with my bed, often avoiding it all together, dreading my nightly routine of jumping into bed exhausted and then finding myself wide awake as soon as the lights are out! I realised that my newly found love affair with Netflix, was not due to a love of TV and film, but was a means of avoiding my nightly dance of ‘I’m tired, I’m not tired ’. Once I’d had my sixth sense moment, I couldn’t wait to get home to bed! I kept imagining the softness of my pillows, the warmth of my duvet, and my flannelette pyjamas! Within the space of two hours, my love affair with my bed was back on! Now I’d love to say that I’ve been sleeping like a baby ever since my orientation but unfortunately that hasn’t been the case. However, now I no longer dread bedtime. When slumber evades me, I use Mindfulness and self-compassion rather than becoming angry and agitated. Rather than winding myself up about how tired I’m going to be tomorrow, I make a mental note to be extra kind to myself the next day. Rather than visualising the bad day I’m going to have, I focus on the now and trying to relax, so that even if I can’t sleep, I still manage to get some rest. If that still doesn’t help, then I focus on the softness of my pillows, the warmth of my duvet, my flannelette pyjamas, and before I know it, I’m either fast asleep or my sleepless night has passed by without me becoming stressed.